is the goal of our company. Our customers are satisfied thanks to outstanding quality, meeting of deadlines and intensive communication. 3D and optical measuring on Mitutoyo and KEYENCE machines. We are learning, building our company and still see opportunities for development and improvement. 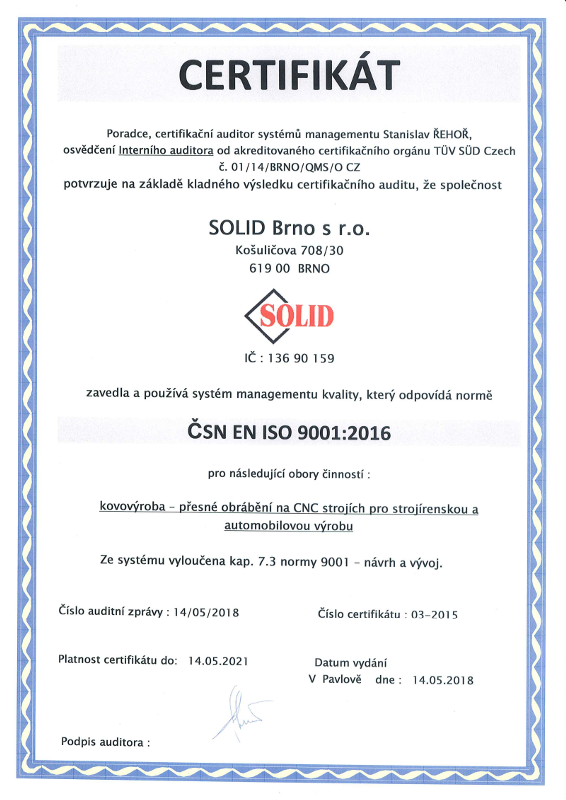 History of SOLID Brno s.r.o. We value our employees, support and respect their needs. SOLID Brno s.r.o. offers precise machining, serial production of parts from 50 pieces. We carry out many other activities which result in a finished product of high quality. We are suppliers of electrotechnic contact wolfram and molybdenum based materials. SOLID Brno s.r.o. 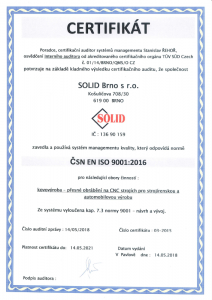 is a stable Czech company with rich history. Copyright © 2019 SOLID Brno s.r.o.